Between February and May 2009 Rome commemorated the 100th anniversary of the first Futurist manifesto through a series of events that not only wished to celebrate this important date, but mainly wanted to re-propose the greatness of the Futurist aesthetic, artistic and social experiences, renewing life and art under every aspect, to the general public. Much space was dedicated to the female creativity of the period that expressed itself in literature, painting, sculpture, dance, cinema and ornamentation, producing, in some cases, significant aesthetic innovations. 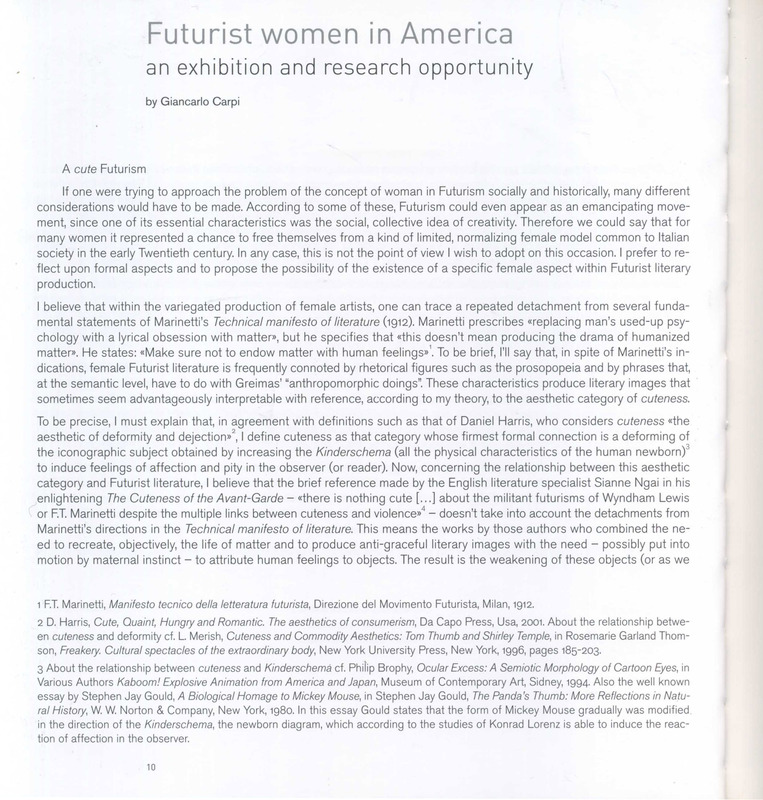 It's therefore a pleasure to note how the interest towards production by Futurist women - which last March had led to the presentation of Giancarlo Carpi's book Futuriste. Letteratura. Arte. Vita - has carried on up to now, with the exhibit Futuriste. 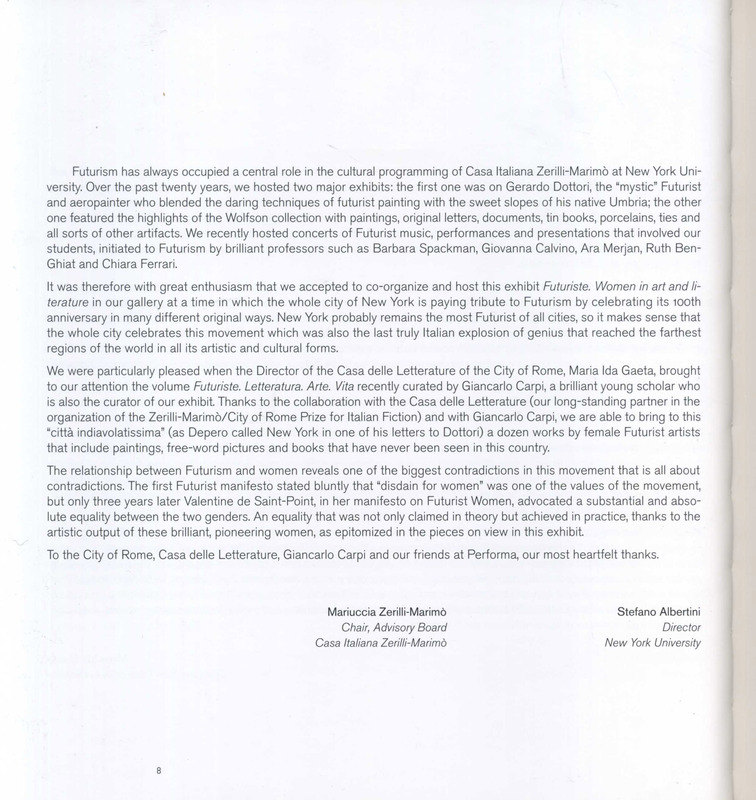 Women in art and literature, hosted by the Casa Italiana Zerilli-Marimo’ in New York. 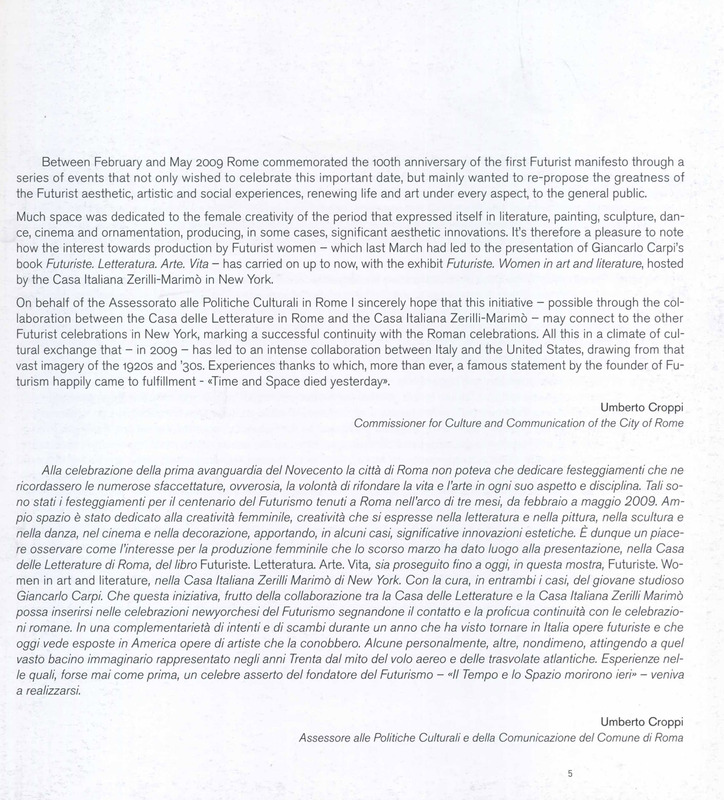 On behalf of the Assessorato alle Politiche Culturali in Rome I sincerely hope that this initiative - possible through the collaboration between the Casa delle Letterature in Rome and the Casa Italiana Zerilli-Marimo’ - may connect to the other Futurist celebrations in New York, marking a successful continuity with the Roman celebrations. All this in a climate of cul¬tural exchange that - in 2009 - has led to an intense collaboration between Italy and the United States, drawing from that vast imagery of the 1920s and '30s. Experiences thanks to which, more than ever, a famous statement by the founder of Futurism happily came to fulfillment - «Time and Space died yesterday». Alla celebrazione della prima avanguardia del Novecento la città di Roma non poteva che dedicare festeggiamenti che ne ricordassero le numerose sfaccettature, ovverosia, la volontà di rifondare la vita e l'arte in ogni suo aspetto e disciplina. Tali sono stati i festeggiamenti per il centenario del Futurismo tenuti a Roma nell'arco di tre mesi, da febbraio a maggio 2009. Ampio spazio è stato dedicato alla creatività femminile, creatività che si espresse nella letteratura e nella pittura, nella scultura e nella danza, nel cinema e nella decorazione, apportando, in alcuni casi, significative innovazioni estetiche. È dunque un piacere osservare come l'interesse per la produzione femminile che lo scorso marzo ha dato luogo alla presentazione, nella Casa delle Letterature di Roma, del libro Futuriste. Letteratura Arte. Vita, sia proseguito fino a oggi, in questa mostra, Futuriste. Women in art and literature, nella Casa Italiana Zerilli Marimò di New York. Con la cura, in entrambi i casi, del giovane studioso Giancarlo Carpi. Che questa iniziativa, frutto della collaborazione tra la Casa delle Letterature e la Casa Italiana Zerilli Marimò possa inserirsi nelle celebrazioni newyorchesi del Futurismo segnandone il contatto e la proficua continuità con le celebrazioni romane. In una complementarietà di intenti e di scambi durante un anno che ha visto tornare in Italia opere futuriste e che oggi vede esposte in America opere di artiste che la conobbero. Alcune personalmente, altre, nondimeno, attingendo a quel vasto bacino immaginario rappresentato negli anni Trenta dal mito del volo aereo e delle trasvolate atlantiche. Esperienze nelle quali, forse mai come prima, un celebre asserto del fondatore del Futurismo - "Il Tempo e lo Spazio morirono ieri" - veniva a realizzarsi. 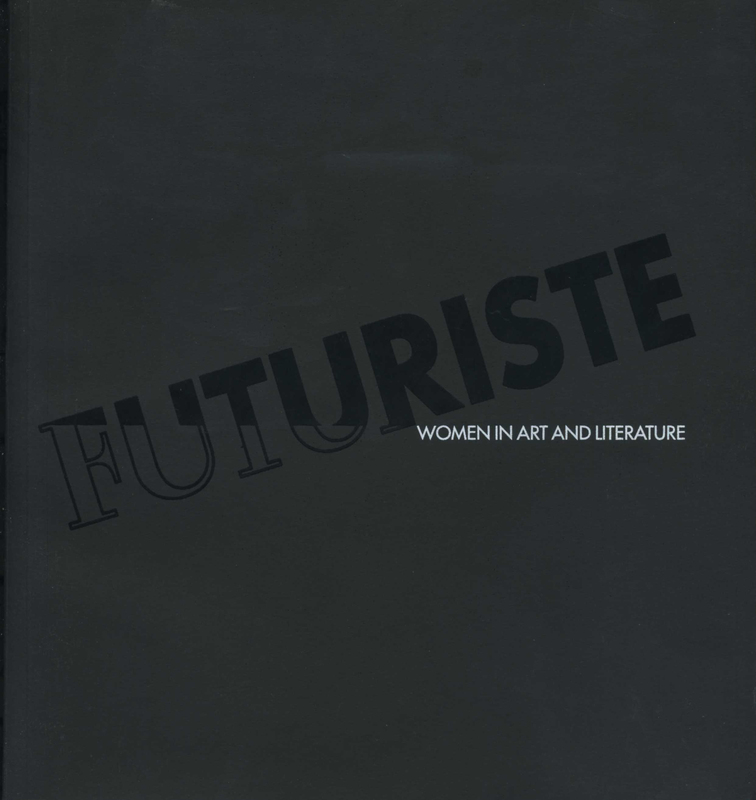 If one were trying to approach the problem of the concept of woman in Futurism socially and historically, many different considerations would have to be made. According to some of these, Futurism could even appear as an emancipating movement, since one of its essential characteristics was the social, collective idea of creativity. 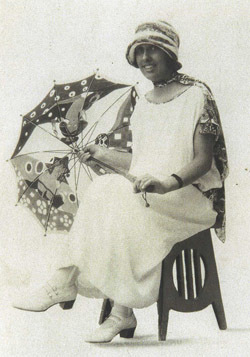 Therefore we could say that for many women it represented a chance to free themselves from a kind of limited, normalizing female model common to Italian society in the early Twentieth century. In any case, this is not the point of view I wish to adopt on this occasion. I prefer to reflect upon formal aspects and to propose the possibility of the existence of a specific female aspect within Futurist literary production. I believe that within the variegated production of female artists, one can trace a repeated detachment from several fundamental statements of Marinetti's Technical manifesto of literature (1912). 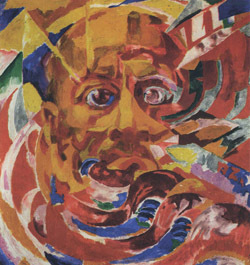 Marinetti prescribes «replacing man's used-up psychology with a lyrical obsession with matter», but he specifies that «this doesn't mean producing the drama of humanized matter». He states: «Make sure not to endow matter with human feelings». To be brief, I'll say that in spite of Marinetti's indications, female Futurist literature is frequently connoted by rhetorical figures such as the prosopopeia and by phrases that, at the semantic level, have to do with Greimas' "anthropomorphic doings". These characteristics produce literary images that sometimes seem advantageously interpretable with reference, according to my theory, to the aesthetic category of cuteness. To be precise, I must explain that, in agreement with definitions such as that of Daniel Harris, who considers cuteness «the aesthetic of deformity and dejection», I define cuteness as that category whose firmest formal connection is a deforming of the iconographic subject obtained by increasing the Kinderschema (all the physical characteristics of the human newborn) to induce feelings of affection and pity in the observer (or reader). 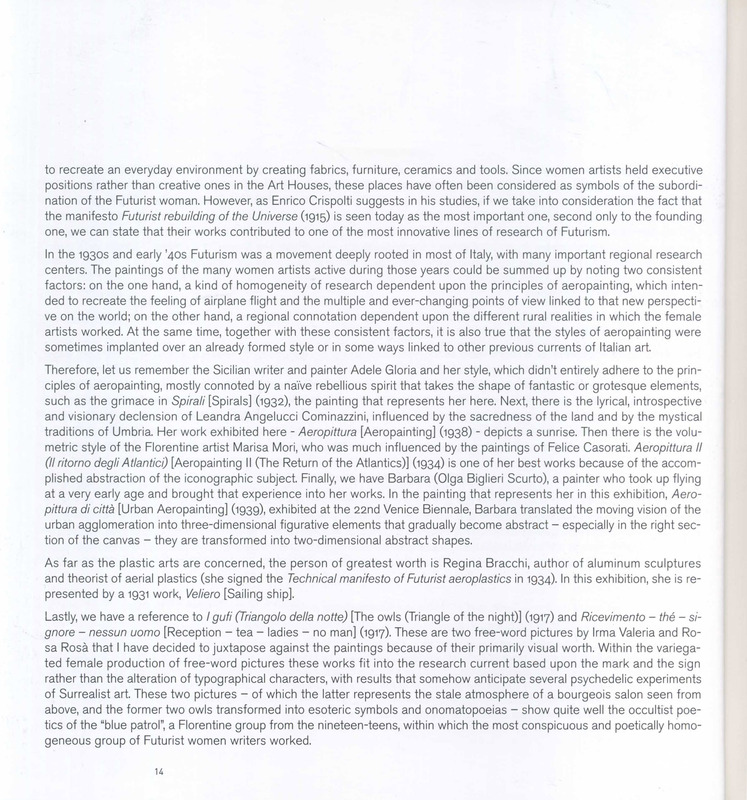 Now, concerning the relationship between this aesthetic category and Futurist literature, I believe that the brief reference made by the English literature specialist Sianne Ngai in his enlightening The Cuteness of the Avant-Garde - «there is nothing cute (...] about the militant futurisms of Wyndham Lewis or F.T. Marinetti despite the multiple links between cuteness and violence» - doesn't take into account the detachments from Marinetti's directions in the Technical manifesto of literature. This means the works by those authors who combined the need to recreate, objectively, the life of matter and to produce anti-graceful literary images with the need - possibly put into motion by maternal instinct - to attribute human feelings to objects. The result is the weakening of these objects (or as we would say using semantic terms, the "negative sanctioning" of these objects) and their attribution to the category of cuteness. Some literary images in Benedetta's Viaggio di Garara' [The Voyage of Garara] (1931), Maria Ginanni's Montagne trasparenti [Transparent Mountains] (1917), Enif Robert's Un ventre di donna [A Woman's Womb] (1919), Irma Valeria's Morbidezze in agguato [Softnesses Waiting in Ambush] (1917), Franca Maria Cornell's Aeropoema futurista dell'Umbria [Futurist Aeropoem from Umbria] (1943) are obvious examples of this undercurrent of literary Futurism that I believe might open up a helpful point of view for research, even with respect to iconology. A single example: «a mocking cupid, on my table, shut its amazed eyes, extending a span of tongue towards me». This literary image seems to represent a Kewpie by the American illustrator Rose Cecil O'Neill, the combination of culeness (the shut eyes) and Kitsch (the unpleasant detail, abnormal, the span of tongue) of her cupids. 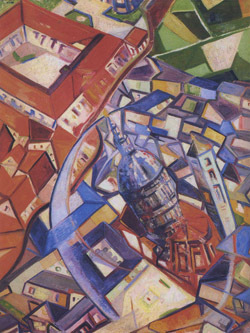 Moving on towards the collection of this American exhibition, I will say that I'm delighted to see the works of the two main female painters of Italian Futurism, Benedetta and Rougena Zatkova. 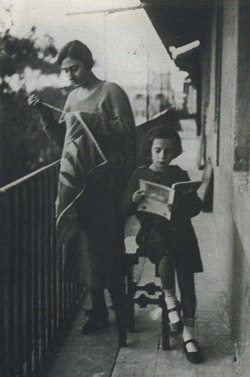 Benedetta, an important figure not only for her role in the development of a female model of creativity but also for her theo¬retical contributions - among others, her involvement in the creation of Marinetti's innovative Manifesto ol Tactilism (1921) - is represented by Luce + rumori di treno notturno [Light + Night Train Noises] (1924). The painting fits into the mechanical poetry of the 1920s because of its subject and its composition, but on the other hand, thanks to the use of protruding metal to represent sound, it demonstrated Benedetta's interest in multi-material experimentation. She shared this interest with Rougena Zatkova, whose production of multi-material and kinetic works of plastic art fits into one of the most important experimentations of plastic Futurism, the "plastic systems" theorized by Giacomo Balla and Fortunato Depero in 1915. 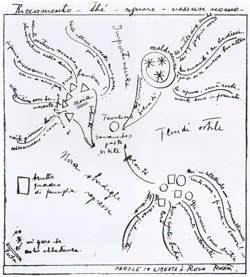 Zatkova is represented here by a famous canvas, Marinetti soleil (1920). 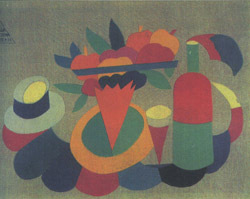 Within the exhibition, Luce Balla's Stilizzazione floreale [Floral stylization] (circa 1920) and Gigia Corona's Natura vivissima [Very Un-still life] (1931) - the latter being a work that displays the chromatic correspondence between Mediterranean sunlight and Sicilian Futurist works - represent the category of artists linked to the textile and ornamental production of the Art Houses, artisan laboratories developed in several different regions of Italy where more or less important Futurist artists tried to recreate an everyday environment by creating fabrics, furniture, ceramics and tools, Since women artists held executive positions rather than creative ones in the Art Houses, these places have often been considered as symbols of the subordination of the Futurist woman. 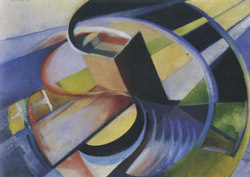 However, as Enrico Crispolti suggests in his studies, if we take into consideration the fact that the manifesto Futurist rebuilding ol the Universe (1915) is seen today as the most important one, second only to the founding one, we can state that their works contributed to one of the most innovative lines of research of Futurism. In the 1930s and early '40s Futurism was a movement deeply rooted in most of Italy, with many important regional research centers. 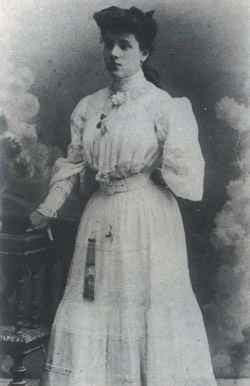 The paintings of the many women artists active during those years could be summed up by noting two consistent factors: on the one hand, a kind of homogeneity of research dependent upon the principles of aeropainting, which intended to recreate the feeling of airplane flight and the multiple and ever-changing points of view linked to that new perspective on the world; on the other hand, a regional connotation dependent upon the different rural realities in which the female artists worked. At the same time, together with these consistent factors, it is also true that the styles of aeropainting were sometimes implanted over an already formed style or in some ways linked to other previous currents of Italian art. 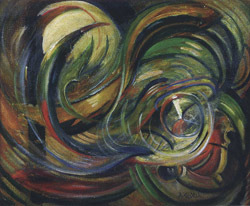 Therefore, let us remember the Sicilian writer and painter Adele Gloria and her style, which didn't entirely adhere to the principles of aeropainting, mostly connoted by a naive rebellious spirit that takes the shape of fantastic or grotesque elements, such as the grimace in Spirali [Spirals] (1932), the painting that represents her here. Next, there is the lyrical, introspective and visionary declension of Leandra Angelucci Cominazzini, influenced by the sacredness of the land and by the mystical traditions of Umbria. 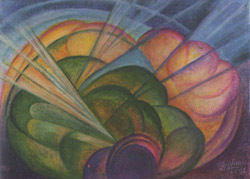 Her work exhibited here - Aeropittura [Aeropainting] (1938) - depicts a sunrise. Then there is the volumetric style of the Florentine artist Marisa Mori, who was much influenced by the paintings of Felice Casorati. Aeropittura II (ll ritorno degli Atlantici) [Aeropainting II (The Return of the Atlantics)] (1934) is one of her best works because of the accomplished abstraction of the iconographie subject Finally, we have Barbara (Olga Biglieri Scurto), a painter who took up flying at a very early age and brought that experience into her works. 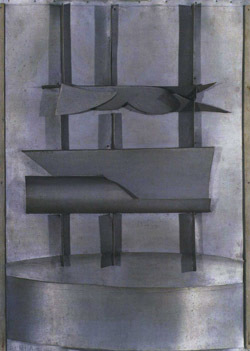 In the painting that represents her in this exhibition, Aeropittura di città [Urban Aeropainting] (1939), exhibited at the 22nd Venice Biennale, Barbara translated the moving vision of the urban agglomeration into three-dimensional figurative elements that gradually become abstract - especially in the right section of the canvas - they are transformed into two-dimensional abstract shapes. 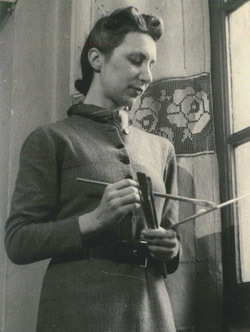 As far as the plastic arts are concerned, the person of greatest worth is Regina Bracchi, author of aluminum sculptures and theorist of aerial plastics (she signed the Technical manifesto of Futurist aeroplastics in 1934). In this exhibition, she is re¬presented by a 1931 work, Veliero [Sailing ship]. Lastly, we have a reference to I gufi (Triangolo della notte) [The owls (Triangle of the night)] (1917) and Ricevimento - thé - signore - nessun uomo [Reception - tea - ladies - no man] (1917). These are two free-word pictures by Irma Valeria and Rosa Rosà that I have decided to juxtapose against the paintings because of their primarily visual worth. Within the variegated female production of free-word pictures these works fit into the research current based upon the mark and the sign rather than the alteration of typographical characters, with results that somehow anticipate several psychedelic experiments of Surrealist art These two pictures - of which the latter represents the stale atmosphere of a bourgeois salon seen from above, and the former two owls transformed into esoteric symbols and onomatopoeias - show quite well the occultist poetics of the "blue patrol", a Florentine group from the nineteen-teens, within which the most conspicuous and poetically homo¬geneous group of Futurist women writers worked. Sarebbero numerose le considerazioni possibili relativamente al ruolo e alla concezione della donna nel Futurismo se si volesse affrontare il problema da un punto di vista sociale e storico. A fronte di tali considerazioni il Futurismo potrebbe anche apparire come un movimento di emancipazione, giacché, essendo l'idea solidale e collettiva della creatività uno dei suoi caratteri essenziali, potremmo dire che esso rappresentò, per molte donne, una possibilità di liberarsi da un modello femminile per certi versi costrittivo, certo normalizzante, quale era quello diffuso nella società italiana dei primi anni del Novecento. Tuttavia non è questo il punto di vista che mi preme adottare in questa occasione. Preferirei ragionare su aspetti formali e proporre l'ipotesi dell'esistenza di uno specifico femminile nella produzione futurista letteraria. 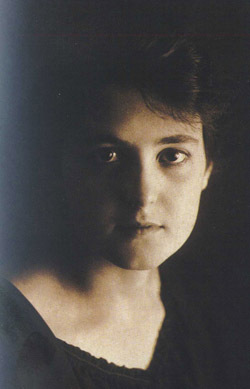 A mio parere nella variegata produzione delle donne è rintracciabile una reiterata deriva da alcuni fondamentali asserti marinettiani del Manifesto tecnico della letteratura (1912). Clarinetti prescrive di «sostituire la psicologia dell'uomo, ormai esaurita, con l'ossessione lirica della materia», ma specifica che «non si tratta di rendere i drammi della materia umanizzata». Afferma: «Guardatevi dal prestare alla materia i sentimenti umani». In sintesi dirò che, a dispetto delle indicazioni di Marinetti, la letteratura futurista femminile spesso è connotata da figure retoriche come la prosopopea e da sintagmi afferenti sul piano semantico al "fare antropomorfico" greimasìano. Caratteristiche, queste, che producono immagini letterarie le quali, in alcuni casi, sembrano vantaggiosamente interpretabili facendo riferimento, questa la mia ipotesi, alla categoria estetica della cuteness. Per precisione sia detto che in accordo con definizioni come quella di Daniel Harris, il quale considera la cuteness «the aesthtic of deformity and dejection», definisco la cuteness come quella categoria il cui più saldo connesso formale sia una deformazione del soggetto iconografico ottenuta accrescendo il Kinderschema (l'insieme delle caratteristiche fisiche del neonato umano) così da indurre nell'osservatore (o nel lettore) sentimenti di affetto e pietà. 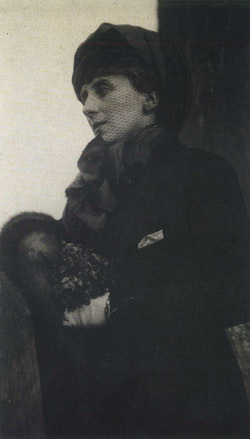 Ora, relativamente alla relazione tra questa categoria estetica e la letteratura futurista, io credo che il breve accenno fatto dall'anglista Sianne Ngai nel suo illuminate The Cuteness of the Avant-Garde - «there is nothing cute [...]about the militant futurisms of Wyndham Lewis or F.T Marinetti despite the multiple links between cuteness and violence» - non tenga conto delle derive rispetto alle indicazioni di Marinetti contenute nel Manifesto tecnico della letteratura. In sintesi, della produzione di quelle letterate le quali, all'istanza di ricreare oggettivamente la vita della materia e di produrre immagini letterarie antigraziose hanno unito quella, forse mossa dall'istinto materno, di attribuire sentimenti umani agli oggetti. Con il risultato di debilitarli (in termini semantici diremmo di "sanzionarli negativamente") e di ascriverli alla categoria della cuteness. Alcune immagini letterarie di Viaggio di Gararà di Benedetta (1931), di Montagne trasparenti di Maria Ginanni (1917), di Un ventre di donna di Enif Robert (1919), di Morbidezze in agguato di Irma Valeria (1917), dell'Aeropoema futurista dell'Umbria di Franca Maria Cornell (1943) sono esempi evidenti di questa sottotendenza del futurismo letterario che a me pare possa aprire una proficua prospettiva di ricerca anche sul piano iconologico. Un solo esempio: «un amorino beffardo, sul mio tavolo, ha sbarrato gli occhi meravigliati, allungandomi un palmo di lingua". Immagine letteraria che sembra rappresentare un Kewpie dell'illustratrice americana Rose Cecil O'Neill , la mistura di cuteness (occhi sbarrati) e Kitsch (il dettaglio sgradevole, abnorme, il palmo di lingua) dei suoi amorini. Nove quadri e due parolibere. 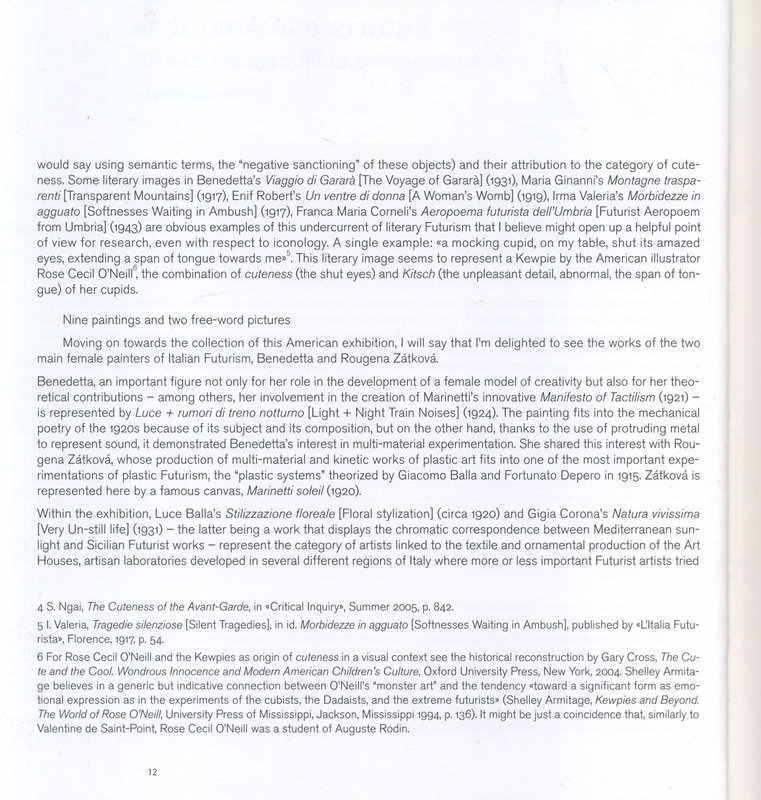 Venendo alla collezione riunita per questa occasione americana dirò che sono lieto di poter vedere rappresentate le due maggiori pittrici del futurismo italiano, Benedetta e Rougena Zàtkovà. 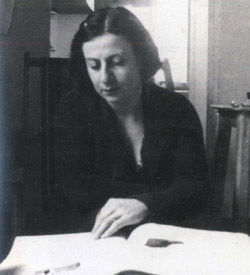 Benedetta, figura importante tanto per il ruolo svolto nella costruzione di un modello di creatività femminile quanto per il suo apporto teorico - ricordiamo il suo contributo all'ideazione di un manifesto innovativo come il Manifesto del Tattilismo di Marinetti (1921) - è rappresentata da Luce + rumori di treno notturno (1924). Quadro che per soggetto e composizione si inscrive nella poetica meccanica degli anni Venti e d'altra parte, nell'uso di metallo aggettante per raffigurare il suono, palesa l'interesse di Benedetta per la sperimentazione polimaterica. Interesse condiviso con Rougena Zàtkovà, la cui produzione di plastici polimaterici e cinetici partecipa di una delle più proficue sperimentazioni del futurismo plastico, ossia quella relativa ai "complessi plastici" teorizzati da Giacomo Balla e Fortunato Depero nel 1915. Zàtkovà è qui rappresentata da una tela celebre, Marinetti soleil (1920). 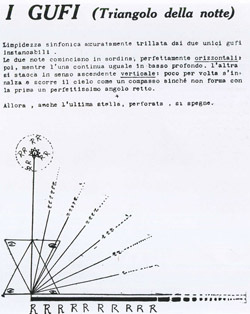 Stilizzazione floreale (1920 c.) di Luce Balla e Natura vivissima (1931) di Gigìa Corona - lavoro, quest'ultimo, che manifesta la rispondenza cromatica tra la solarità mediterranea e la produzione futurista siciliana - rappresentano in mostra la categoria delle artiste legate alla produzione tessile e decorativa delle Case d'arte. Ossia laboratori artigianali sviluppatisi in diverse regioni d'Italia nei quali artisti maggiori e minori del Futurismo cercarono di ricreare l'ambiente quotidiano ideando tessuti, mobili, ceramiche e utensili. Poiché nell'ambito delle Case d'arte quelle artiste ricoprirono un ruolo esecutivo piuttosto che ideativo spesso si è voluto considerarle come figure emblematiche della subordinazione della donna futurista. Tuttavia, se consideriamo, sul- la scorta degli studi di Enrico Crispolti, che oggi il manifesto Ricostruzione futurista dell'universo (1915) è ritenuto il più importante dopo il manifesto di fondazione, possiamo affermare che il loro lavorò contribuì a una delle linee di ricerca più innovative del Futurismo. Negli anni Trenta e nei primi anni Quaranta il Futurismo era ormai un movimento radicato in gran parte del territorio italiano nel quale erano sorti significativi nuclei di ricerca regionali. La pittura delle numerose artiste attive in questi anni può essere sintetizzata tenendo conto di due costanti. Da un lato una certa omogeneità di ricerca dipendente dai principi dell'aeropittura, i quali prescrivevano di ricreare le sensazioni del volo in aeroplano e le prospettive plurime e mutevoli legate a quella nuova prospettiva sul mondo. Dall'altro una connotazione regionale dipendente dalle differenti realtà rurali nelle quali le artiste si trovavano a operare. Per quanto, al di là di queste costanti, è anche vero che gli stilemi dell'aeropittura a volte andarono a innestarsi su uno stile già formato o debitore di altre correnti dell'arte italiana. Ricordiamo allora la scrittrice e pittrice siciliana Adele Gloria e il suo stile solo a tratti aderente ai principi dell'aeropittura, per lo più connotato da un ingenuo spirito di ribellione che prende forma in elementi fantastici o grotteschi, a esempio la smorfia nel quadro che qui la rappresenta, Spirali (1932). Poi la declinazione lirica e introspettiva, visionaria, di Leandra Angelucci Cominazzini, influenzata dalla sacralità del territorio e della tradizione mistica dell'Umbria. 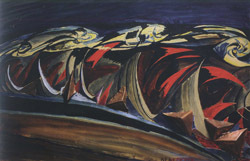 L'opera in mostra, Aeropittura (1938), raffigura un'aurora. Inoltre lo stile volumetrico della fiorentina Marisa Mori, che risente dalla pittura di Felice Casorati. Aeropittura II (Il ritorno degli Atlantici) (1934), è una delle sue opere più riuscite per la compiuta astrazione del soggetto iconografico. 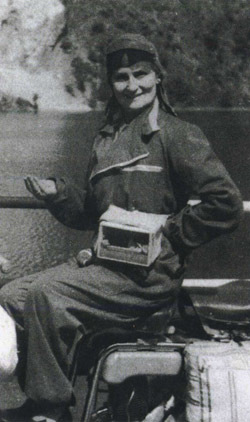 Infine Barbara (Olga Biglieri Scurto), pittrice che praticò il volo aereo fin da giovanissima e che nei suoi lavori trasportò la propria esperienza vissuta. Nel quadro che la rappresenta in questa esposizione, Aeropittura di città (1939), esposto nella XXII Biennale di Venezia, Barbara ha tradotto la visione in movimento dell'agglomerato urbano in elementi figurativi tridimensionali che vanno gradualmente astraendosi - con evidenza nella parte destra della tela - fino a divenire forme astratte bidimensionali. 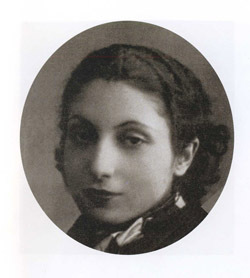 In campo plastico staglia per valore la figura di Regina Bracchi, autrice di sculture in alluminio e teorica della plastica aerea (firmò nel 1934 il Manifesto tecnico dell'aeroplastica futurista). A rappresentarla in questa esposizione un'opera del 1931, Veliero. Infine un accenno a I gufi (Triangolo della notte) (1917) e a Ricevimento - thé - signore - nessun uomo (1911). Tavole parolibere di Irma Valeria e Rosa Rosa che per il loro valore preminentemente visivo ho deciso di accostare ai quadri. 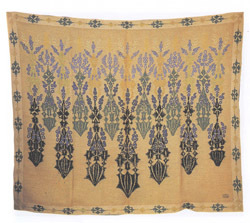 Entro la variegata produzione femminile di tavole parolibere queste opere si collocano nel filone di ricerca basato sulla traccia e sul segno piuttosto che sull'alterazione dei caratteri tipografici, con esiti che, per certi aspetti, anticipano alcuni esperimenti psichedelici dell'arte surrealista. Queste due tavole - la prima rappresenta l'atmosfera stantia di un salotto borghese visto dall'alto, la seconda due gufi trasfigurati in simboli esoterici e onomatopee - bene evidenziano la poetica occultistica della "pattuglia azzurra", compagine entro la quale negli anni Dieci, a Firenze, operò il più cospicuo e poeticamente omogeneo gruppo di scrittrici futuriste. Luce Balla, Stilizzazione floreale, 1920 ca.